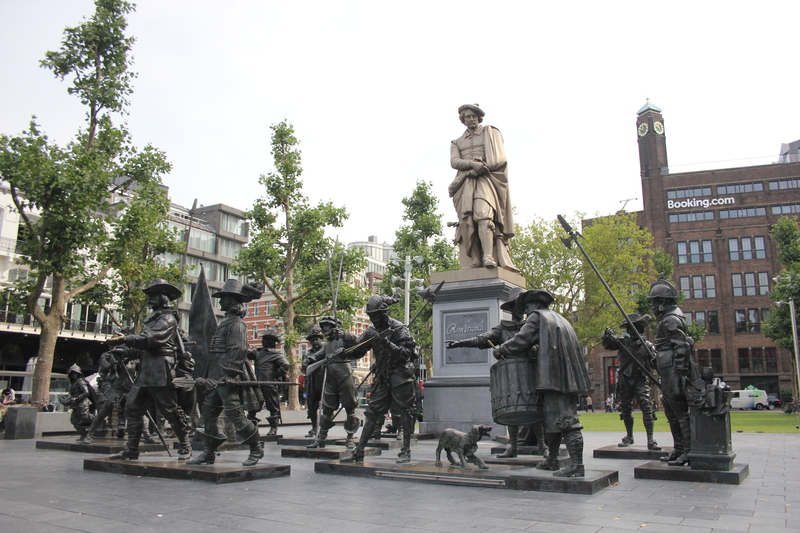 Rembrandtplein is a square in the centre of Amsterdam named after the artist Rembrandt van Rijn. 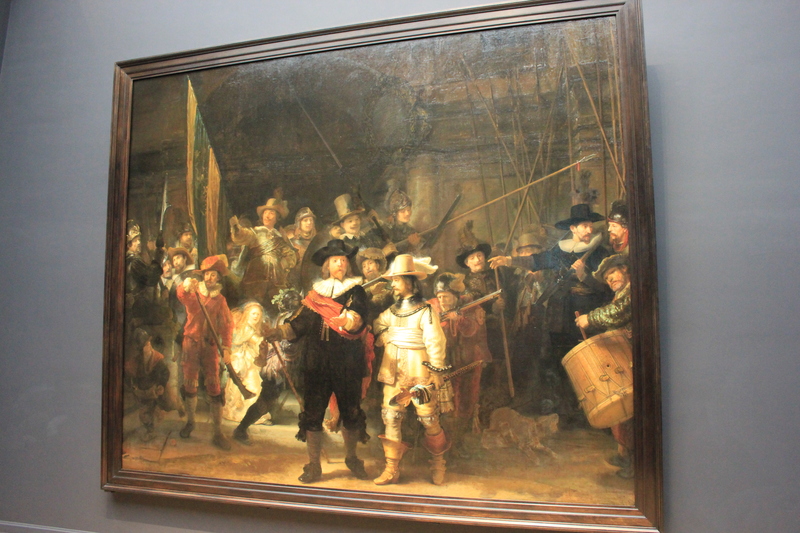 Rembrandt is one of the Old Masters and one of the most important and influential Dutch painters. He had a house just over the other side of the River Amstel, where he lived, taught and worked from 1639-1656. There is a statue of him in Rembrandtplein, and in front of that statue we saw several others. 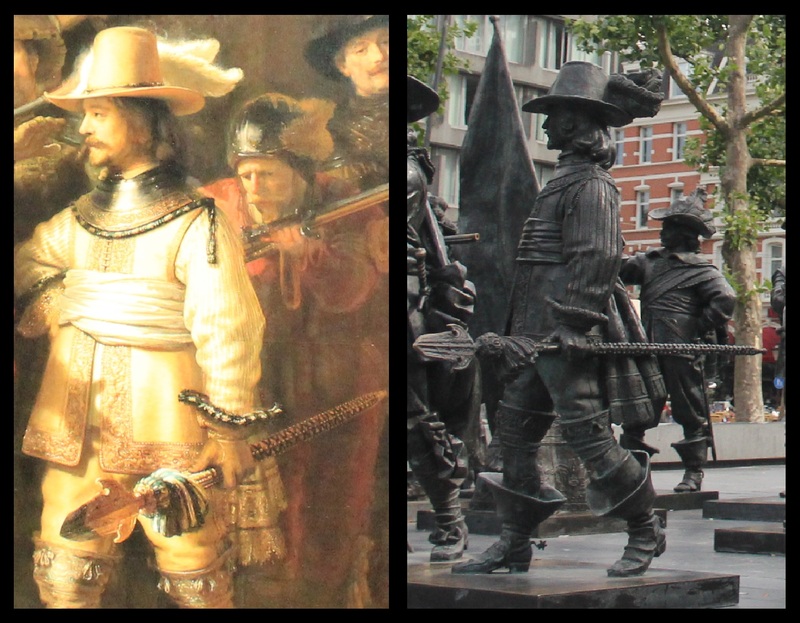 These were bronze characters from one of his most famous paintings, “The Night Watch“. In fact, that is not its true name. Its formal title is “The Militia Company of Captain Frans Banning Cocq and Lieutenant Willem van Ruytenburch preparing to march out“. Here they are, readying themselves for their adventures, overlooked by the Old Master himself. Here they are in a bit more detail. This, I presume, is Captain Frans Banning Cocq. See how the statue’s hand gleams where it has been shaken so many times by tourists? This drummer is nearly cut out of the painting, but the scene in Rembrandtplein puts him firmly back in the action. In the painting, this rifleman is partially obscured from view, but as a statue the lucky man gets his right arm back, after more than 350 years of having to do without. In the painting he is looking intently at his flintlock. As a statue, however, he is looking quizzically at his new-found arm, wondering where on earth it just materialised from after so many years! 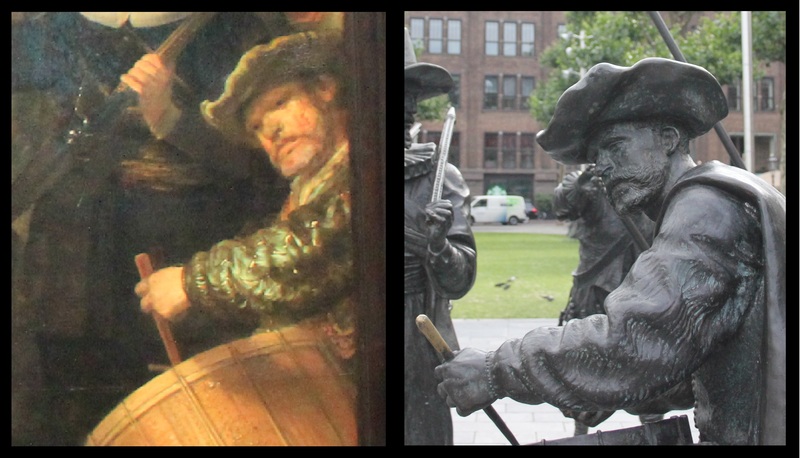 This entry was posted in Netherlands and tagged amsterdam, Captain Frans Banning Cocq, netherlands, rembrandt, rembrandtplein, statue, The Night Watch, tourist, travel, walking. Bookmark the permalink. Thank you! I had good fun putting those photos together! I love the way you matched up the painting to the statues!